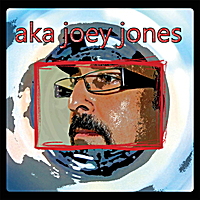 Welcome to akajoeyjones.com. This site marks my crossroads in the virtual world. It's dedicated to a realization that I came to while recording The Greatest Show Never Seen with Mass Conception. Recording the album was inspiring. It was an exhilarating experience crafting our music and bringing new dimensions to it in a professional studio. I realized all my music had to be produced and finished in this way, and this journey began. That's not quite true. The journey really began a few years back--but then again where and when do journeys ever really begin. Over the past six or seven years, I have been writing and recording in my basement studio. I've amassed quite a number of songs, songs I keep coming back to and working on but that I've never finished. I am now compelled to finish them. These songs will form the foundation of aka joey jones. But aka joey jones is about the future as well. These past few months have been especially prolific for me, and I've come up with many new ideas--ideas I need to develop and explore. I also plan to use this project as an opportunity to engage in some collaborative efforts with many of the creative souls and excellent musicians--some known, some unknown--who've crossed my path. I'm going to continue with Mass Conception. Being in a band is rewarding in its own right. aka joey jones is an augmentation of that experience, a chance to develop music that doesn't really fit with what we are as a group. My debut release will be an eponymously title three-track EP. It will have two original songs and Cure cover. It is scheduled for release on Tuesday, September 11. Next, though, I'll explain why aka joey jones. Love your music Joe....good luck!!! !